This article is about the German city. For other uses, see Bremen (disambiguation). listen)) is a Hanseatic city in northwestern Germany. A commercial and industrial city with a major port on the River Weser, Bremen is part of the Bremen-Oldenburg metropolitan area (2.4 million people). Bremen is the third most populous city in Northern Germany and tenth in Germany. The marshes and moraines near Bremen have been settled since about 12000 BC. Burial places and settlements in Bremen-Mahndorf and Bremen-Osterholz date back to the 7th century AD. In 150 AD the geographer Ptolemy refers to Fabiranum or Phabiranum, known today as Bremen. At that time the Chauci lived in the area now called north-western Germany or Lower Saxony. By the end of the 3rd century, they had merged with the Saxons. During the Saxon Wars (772–804) the Saxons, led by Widukind, fought against the West Germanic Franks, the founders of the Carolingian Empire, and lost the war. Charlemagne, the King of the Franks, made a new law, the Lex Saxonum. This law stated that Saxons were not allowed to worship Odin (the god of the Saxons), but rather that they had to convert to Christianity on pain of death. This period was called the Christianisation. In 787 Willehad of Bremen was the first Bishop of Bremen. In 848 the archdiocese of Hamburg merged with the diocese of Bremen into Hamburg-Bremenn Archdiocese, seated in Bremen, and in the following centuries the archbishops of Hamburg-Bremen were the driving force behind the Christianisation of Northern Germany. In 888 Archbishop Rimbert, managed to get Kaiser Arnulf of Carinthia, the Carolingian King of East Francia, to grant Bremen the right to hold its own markets, to mint its own coins and make its own customs laws. The first stone city walls were built in 1032. Around this time trade with Norway, England and the northern Netherlands began to grow, thus increasing the importance of the city. In 1186 the Bremian Prince-Archbishop Hartwig of Uthlede and his bailiff in Bremen confirmed — without generally waiving the prince-archiepiscopal overlordship over the city — the Gelnhausen Privilege, by which Frederick I Barbarossa granted the city considerable privileges. The city was recognised as a political entity with its own laws. Property within the municipal boundaries could not be subjected to feudal overlordship; this also applied to serfs who acquired property, if they managed to live in the city for a year and a day, after which they were to be regarded as free persons. Property was to be freely inherited without feudal claims for reversion to its original owner. This privilege laid the foundation for Bremen's later status of imperial immediacy (Free Imperial City). In 1362, representatives of Bremen rendered homage to Albert II, Prince-Archbishop of Bremen in Langwedel. In return Albert confirmed the city's privileges and brokered a peace between the city and Gerard III, Count of Hoya, who since 1358 had held some burghers of Bremen in captivity. The city had to bail them out. In 1365 an extra tax, levied to finance the ransom, caused an uprising among the burghers and artisans which was put down by the city council after much bloodshed. In 1366, Albert II tried to take advantage of the dispute between Bremen's council and the guilds, whose members had expelled some city councillors from the city. When these councillors appealed to Albert II for help, many artisans and burghers regarded this as treason against the city. This appeal to the princes would only provoke them to abolish autonomy of the city. The fortified city maintained its own guards, not allowing prince-archiepiscopal soldiers to enter it. The city reserved an extra very narrow gate, the so-called Bishop's Needle (Latin: Acus episcopi, first mentioned in 1274), for all clergy including the Prince-Archbishop. The narrowness of the gate made it technically impossible to enter accompanied by knights. Nevertheless, on the night of 29 May 1366, Albert's troops helped by some burghers invaded the city. After this the city had to render him homage again, the Bremen Roland, symbol of the city's autonomy, was demolished and a new city council was appointed. In return the new council granted Albert a credit amounting to the enormous sum of 20,000 Bremian Marks. But city councillors of the previous council, who had fled to the County of Oldenburg gained the support of the Counts and recaptured the city on June 27, 1366. The members of the intermediate council were regarded as traitors and beheaded, and the city de facto regained its autonomy. Thereupon, the city of Bremen, which had for a long time held an autonomous status, acted almost in complete independence of the Prince-Archbishop. Albert failed to reduce the city of Bremen a second time, since he was always short of money and without the support of his family, the Welfs, who fought the Lüneburg War of Succession (1370–88). By the end of the 1360s Bremen had granted credits to Albert II, to finance his lavish lifestyle, and gained in return the fortress of Vörde and the dues levied in the bailiwick belonging to it as a pawn for the credits. In 1369 Bremen again lent money to Albert II against the collateral of his mint and his right to mint coins, which was from then on run by the city council. In 1377 Bremen bought — from Frederick, Duke of Brunswick-Lüneburg — many of the prince-archiepiscopal castles, which Albert had pledged as security for a loan to Frederick's predecessor. Thus Bremen gained a powerful position in the Prince-Archbishopric (ecclesiastical principality), pushing its actual ruler aside. In 1380 knights of the von Mandelsloh family and others Verdian and Bremian robber barons plundered the burghers of Bremen and the people of the entire Prince-Archbishopric of Bremen. In 1381 the city's troops successfully ended this brigandage and captured the castle of Bederkesa and the bailiwick belonging to it, which it was able to hold until November 1654, when after the Second Bremian War Bremen had to cede Bederkesa and Lehe (a part of present-day Bremerhaven) to Bremen-Verden. In 1386 the city of Bremen made vassals of the noble families, which held the estates of Altluneburg (a part of present-day Schiffdorf) and Elmlohe. When the Protestant Reformation swept through Northern Germany, St Peter's cathedral belonged to the cathedral immunity district (German: Domfreiheit), an extraterritorial enclave of the neighbouring Prince-Archbishopric of Bremen. In 1532, the cathedral chapter which was still Catholic at that time closed St Peter's after a mob consisting of Bremen's burghers had forcefully interrupted a Catholic mass and prompted a pastor to hold a Lutheran service. In 1547, the chapter, which had in the mean time become predominantly Lutheran, appointed the Dutch Albert Rizaeus, called Hardenberg, as the first Cathedral pastor of Protestant affiliation. Rizaeus turned out to be a partisan of the Zwinglian understanding of the Lord's Supper, which was rejected by the then Lutheran majority of burghers, the city council, and chapter. So in 1561 — after heated disputes — Rizaeus was dismissed and banned from the city and the cathedral again closed its doors. However, as a consequence of that controversy the majority of Bremen's burghers and city council adopted Calvinism by the 1590s, while the chapter, which was at the same time the body of secular government in the neighbouring Prince-Archbishopric, clung to Lutheranism. This antagonism between a Calvinistic majority and a Lutheran minority, though it had a powerful position in its immunity district (mediatised as part of the city in 1803), remained dominant until in 1873 the Calvinist and Lutheran congregations of Bremen were reconciled and founded a united administrative umbrella Bremian Protestant Church, which still exists today, comprising the bulk of Bremen's burghers. In May 1625 Christian IV of Denmark, Duke of Holstein was elected — in the latter of his functions — by the Lower Saxon Circle's member territories commander-in-chief of the Lower Saxon troops. In the same year Christian IV joined the Anglo-Dutch military coalition. Christian IV ordered his troops to capture all the important traffic hubs in the Prince-Archbishopric and commenced the Battle of Lutter am Barenberge, on 27 August 1626, where he was defeated by the Leaguist troops under Johan 't Serclaes, Count of Tilly. Christian IV and his surviving troops fled to the Prince-Archbishopric and established their headquarters in Stade. In October 1631 an army, newly recruited by John Frederick, started to reconquer the Prince-Archbishopric — helped by forces from Sweden and the city of Bremen. John Frederick returned to office, only to implement the supremacy of Sweden, insisting that it retain supreme command until the end of the war. With the impending enforcement of the military Major Power of Sweden over the Prince-Archbishopric of Bremen, which was under negotiation at the Treaty of Westphalia, the city of Bremen feared it would fall under Swedish rule too. Therefore the city appealed for an imperial confirmation of its status of imperial immediacy from 1186 (Gelnhausen Privilege). In 1646 Ferdinand III, Holy Roman Emperor, granted the requested confirmation (Diploma of Linz) to the Free Imperial City. 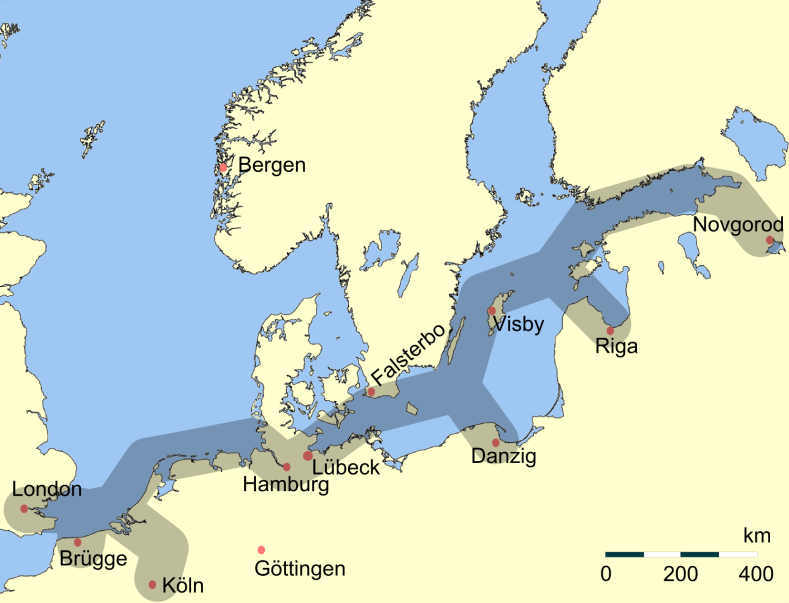 Nevertheless, Sweden, represented by its imperial fief Bremen-Verden, which comprised the secularised prince-bishoprics of Bremen and Verden, did not accept the imperial immediacy of the city of Bremen. Swedish Bremen-Verden tried to remediatise the Free Imperial City of Bremen (i.e. to make it switch its allegiance to Sweden). With this in view, Swedish Bremen-Verden twice waged war on Bremen. In 1381 the city of Bremen had imposed de facto rule in an area around Bederkesa and west of it as far as the lower branch of the Weser near Bremerlehe (a part of present-day Bremerhaven). Early in 1653, Bremen-Verden's Swedish troops captured Bremerlehe by force. In February 1654 the city of Bremen managed to get Ferdinand III, Holy Roman Emperor, to grant it a seat and the vote in the Holy Roman Empire's Diet, thus accepting the city's status as Free Imperial City of Bremen. Ferdinand III demanded that Christina of Sweden, Duchess regnant of Bremen-Verden, compensate the city of Bremen for the damages caused and restitute Bremerlehe. When in March 1654 the city of Bremen started to recruit soldiers in the area of Bederkesa, in order to prepare for further arbitrary acts, Swedish Bremen-Verden enacted the First Bremian War (March to July 1654), arguing that it was acting in self-defence. The Free Imperial City of Bremen had meanwhile urged Ferdinand III to support it, who in July 1654 asked Charles X Gustav of Sweden, Christina's successor as Duke of Bremen-Verden, to cease the conflict, which resulted in the Recess of Stade (November 1654). This treaty left the main issue, the acceptance of the city of Bremen's imperial immediacy, unresolved. But the city agreed to pay tribute and levy taxes in favour of Swedish Bremen-Verden and to cede its possessions around Bederkesa and Bremerlehe, which was why it was later called Lehe. In 1700 Bremen introduced — like all Protestant territories of imperial immediacy — the Improved Calendar, as it was called by Protestants, in order not to mention the name of Pope Gregory XIII. So Sunday, 18 February of Old Style was followed by Monday, 1 March New Style. The harbour of Vegesack became part of the city of Bremen in 1803. In 1811, Napoleon invaded Bremen and integrated it as the capital of the Département de Bouches-du-Weser (Department of the Mouths of the Weser) into the French State. In 1813, the French — as they retreated — withdrew from Bremen. Johann Smidt, Bremen's representative at the Congress of Vienna, was successful in achieving the non-mediatisation of Bremen, Hamburg and Lübeck by which they were not incorporated into neighbouring monarchies, but became sovereign republics. The first German steamship was manufactured in 1817 in the shipyard of Johann Lange. Brauerei Beck & Co KG, a brewery, was founded in 1837 and remains in operation today. The shipping company The North German Lloyd (NDL) was founded in 1857. Lloyd was a byword for commercial shipping and is now a part of Hapag-Lloyd. In 1872, the Bremen Cotton Exchange was created. A Soviet (Council) Republic of Bremen existed from November 1918 to February 1919 in the aftermath of World War I before it was overthrown by Gerstenberg Freikorps. As of 2009, Bremen had a population of 547,700 of whom about 137,000 (~25%) were of non-German origin/ethnicity. Number of minorities (1st and 2nd generation) in Bremen by country of origin per 31 December 2006. One of the two mayors (Bürgermeister) is elected President of the Senate (Präsident des Senats) and serves as head of the city and the state. The current President is Jens Böhrnsen. The Marktplatz (Market square) is dominated by the opulent façade of the Town Hall of Bremen. The building was erected between 1405 and 1410 in Gothic style, but the façade was built two centuries later (1609–12) in Renaissance style. The Town Hall is the seat of the President of the Senate of Bremen. Today, it hosts a restaurant in original decor with gigantic wine barrels, the Ratskeller in Bremen, and the wine lists boasts more than 600 — exclusively German — wines. It is also home of the twelve oldest wines in the world, stored in their original barrels in the Apostel chamber. In July 2004, along with the Bremen Roland, the building was added to the list of UNESCO World Heritage Sites. Two statues stand to the west side of the Town Hall: one is the statue Bremen Roland (1404) of the city's protector, Roland, with his view against the Cathedral and bearing Durendart, the "sword of justice" and a shield decorated with an imperial eagle. The other near the entrance to the Ratskeller is Gerhard Marcks' bronze sculpture (1953) Die Stadtmusikanten (Town Musicians) which portrays the donkey, dog, cat and rooster of the Grimm Brothers' fairy tale. Off the south side of the Markplatz, the 110 m (120 yd) Böttcherstraße was transformed in 1923–1931 by the coffee magnate Ludwig Roselius, who commissioned local artists to convert the narrow street (in medieval time, the street of the barrel makers) into an inspired mixture of Gothic and Art Nouveau. It was considered "entartete Kunst" (degenerate art) by the Nazis. Today, the street is one of Bremen's most popular attractions. Tucked away between the Cathedral and the river is the Schnoor, a small, well-preserved area of crooked lanes, fishermen's and shipper's houses from the 17th and 18th centuries, now occupied by cafés, artisan shops and art galleries. More than 3,100 persons are employed at Bremen, the second largest Airbus site in Germany. As part of the Centre of Excellence - Wing/Pylon, Bremen is responsible for the design and manufacture of high-lift systems for the wings of Airbus aircraft. The entire process chain for the high-lift elements is established here, including the project office, technology engineering, flight physics, system engineering, structure development, verification tests, structural assembly, wing equipping and ultimate delivery to the final assembly line. In addition, Bremen manufactures sheet metal parts like clips and thrust crests for all Airbus aircraft as part of the Centre of Excellence — Fuselage and Cabin. A large number of food producing or trading companies are located in Bremen with their German or European headquarters: Anheuser–Busch InBev (Beck's Brewery), Kellogg's, Kraft Foods (Kraft, Jacobs Coffee, Milka Chocolate, Milram, Miràcoli), Frosta (frosted food), Nordsee (chain of sea fast food), Melitta Kaffee, Eduscho Kaffee, Azul Kaffee, Vitakraft (pet food for birds and fishes), Atlanta AG (Chiquita banana), chocolatier Hachez (fine chocolate and confiserie), feodora chocolatier. Bremer Straßenbahn AG (translates from German as Bremen Tramways Corporation), often abbreviated BSAG, is the public transport provider for Bremen, offering tramway and bus services. Every year since 1036, in the last two weeks of October, Bremen has hosted Freimarkt ("Free market"), one of the world's oldest and in Germany one of today's biggest continuously celebrated fairground festivals. Bremen is also host for the "Bremer 6 Tage Rennen" a bicycle race at the Bremen Arena. On March 12, 1999, the rock band Kiss played a live show here. Before the show they were told by the fire marshall not to use any fireworks. During the show they used no fireworks, but at the end, they set off all of the fireworks at once. Because of this, they are now banned from playing in Bremen. Bremen was host to the 32nd Deutscher Evangelischer Kirchentag from 20 to 24 May 2009. Bremen hosted the 50th International Mathematical Olympiad (IMO) from 10 to 22 July 2009. Bremen is home to the football team SV Werder Bremen which won the German Football Championship for the fourth time and the German Football Cup for the fifth time in 2004, making SV Werder Bremen just the fourth team in German football history to win the double; the club won the German Football Cup for the sixth time in 2009. Only Bayern Munich has won more titles. In the final match of the 2009–10 season, Werder Bremen competed with Bayern Munich but lost. The Weserstadion, the home stadium of the SV Werder Bremen, is currently under construction. After being finished, the stadium will be a pure football stadium, almost completely surrounded by solar cells. It will be one of the biggest buildings in Europe delivering alternative energies. With 18000 students, the University of Bremen is the largest university in Bremen, and is also home to the international Goethe-Institut and the Fallturm Bremen. Additionally, Bremen has a University of the Arts and the Bremen University of Applied Sciences. In 2001, the private Jacobs University Bremen was founded. All major German research foundations maintain institutes in Bremen, with a focus set on marine sciences: The Max Planck Society with the Max Planck Institute for Marine Microbiology, and the Gottfried Wilhelm Leibniz Scientific Community with the Center for Tropical Marine Ecology (zmt). The Bremerhaven based Alfred-Wegener-Institute of the Helmholtz Association closely cooperates with the aforementioned institutes, especially within the MARUM, a center for marine environmental sciences, affiliated to the University of Bremen. Furthermore, The Fraunhofer Society is present in Bremen with centers for applied material research IFAM and medical image computing MEVIS. Friedemann Friese — Designer of Power Grid and other board games. Reinhard Hardegen — Member of Bremen Parliament and former U-boat commander of submarine U-123. Charles Henry Nimitz (1826–1911) Born in Bremen. In 1852, built the Nimitz Hotel in Fredericksburg, Texas, which now houses the National Museum of the Pacific War. Grandfather of United States Fleet Admiral Chester Nimitz. Elected to the Texas Legislature 1890. Dannenberg, Hans-Eckhard and Heinz-Joachim Schulze (eds.) (1995-2008). Geschichte des Landes zwischen Elbe und Weser (3 vol., vol. 1 Vor- und Frühgeschichte (1995), vol. 2 Mittelalter (einschl. Kunstgeschichte) (1995), vol. 3 Neuzeit (2008), (Schriftenreihe des Landschaftsverbandes der ehem. Herzogtümer Bremen und Verden; vol. 7) ed.). Stade: Landschaftsverband der ehem. Herzogtümer Bremen und Verden. ISBN (vol. 1) ISBN 978-3-9801919-7-5, (vol. 2) ISBN 978-3-9801919-8-2, (vol. 3) ISBN 978-3-9801919-9-9. ^ Dutch independence was finally confirmed by the Treaty of Westphalia in 1648. ^ "Bremen (Germany)". City Population. http://www.citypopulation.de/php/germany-bremen.php. Retrieved 7 June 2011. ^ "Ergebnisse der Bürgerschaftswahlen in Bremen". http://www.wahlrecht.de/ergebnisse/bremen.htm. ^ Passivhaus schools (German), Passivhaus Institute. Retrieved 2007-05-30. ^ "EADS in Germany". Eads.com. http://www.eads.com/1024/en/eads/locations_extern/locations/europe/germany/bremen.html. ^ "Airbus in Germany". Airbus.com. http://stagev4.airbus.com/en/worldwide/airbus_in_germany.html. ^ "Mercedes-Benz Bremen Plant". www.daimler.com. http://www.daimler.com/dccom/0-5-1037145-1-36807-1-0-0-0-0-0-12075-7145-0-0-0-0-0-0-0.html. ^ "BSAG Public transportation in Bremen" (in German). bsag.de. http://www.bsag.de. ^ "Message of Greeting". Imo2009.de. http://www.imo2009.de/imo/index.php?option=com_content&view=frontpage&Itemid=1&lang=en. Retrieved 2009-06-18. ^ "Zahlen und Fakten zur Universität (german)". University of Bremen. 2011-10-16. http://www.uni-bremen.de/universitaet/die-uni-im-ueberblick/zahlen-fakten.html. Retrieved 2011-10-16. ^ "Gdańsk Official Website: 'Miasta partnerskie'" (in Polish & English). Urząd Miejski w Gdańsku. 2009. http://www.gdansk.pl/samorzad,62,733.html. Retrieved 2009-07-11. ^ "Bratislava City - Twin Towns". Bratislava-City.sk. http://www.bratislava-city.sk/bratislava-twin-towns. Retrieved 2008-10-26. ^ "House of Commons Hansard Debates for 2 Dec 1996". parliament.uk. http://www.publications.parliament.uk/pa/cm199697/cmhansrd/vo961202/debtext/61202-25.htm. Retrieved 12 October 2011. This page uses content from the English language Wikipedia. The original content was at Bremen. The list of authors can be seen in the page history. As with this Familypedia wiki, the content of Wikipedia is available under the Creative Commons License.